Sitting right across the Potomac River from D.C., Arlington is often thought of a cheaper alternative for those working in D.C. That’s great and all, but the city has so much of its own history and character, that it should almost be the other way around. If you are a dog owner worried about not having anywhere to give your companion some space to play, well, you don’t have to worry. The area is rich with pet-friendly parks such as Shirlington Dog Park, Fort Ethan Allen dog park and Towers dog park, just to name a few. There are also other outdoor adventuring possibilities for you and your furry friend such as the Great Falls National Park that offers hiking along the Potomac River. The city is rich in education and boasts a high 72% of its population having a college degree or higher. It is home to several universities such as George Mason and Marymount, the North Virginia Center for VA and Virginia Tech. Also, the Northern Virginia Community College has some of the highest ratings and reviews for a community college in the country and is said to be better than many four year institutions. While these attributes certainly pave the way for a highly-educated city, Arlington lays it out on the ground floor as well. The public schools are famous for being some of the best in the nation with high school graduation rates as high as 98.5%, a much higher percentage of Public School students earning advance diplomas than the state average, and 91% of APS graduates planning to attend a 2 or 4 year college. It’s no secret that Arlington is a costly city. The cost of living is 153% of the national average while housing costs are three times higher than the norm. In order to find those cheap Arlington apartments for rent, your best bet is going to be using an apartment finder or apartment guide to narrow down the sweet deals that are actually trustworthy. Clarendon has become a popular neighborhood and there’s good reason behind it. There is a wide variety of food (a result of the area’s great diversity) so that you can find anything from Persian to Thai within blocks from one another. You’ll find bar goers on the weekends and intimate music venues. Clarendon works well for commuters with its metro station, so if you move to Clarendon and are determined, you can get rid of your car pretty easily. If you are looking for a place to live, you’ll easily find many apartment options in Clarendon that range from small studio apartments with utilities included to newly developed luxury apartments. You’ll also find condos available and townhomes for rent, and further out towards Arlington’s borders and closer to Lyon Village, you’ll find homes and houses for rent. Another option great for those looking for apartments for rent in a fun and exciting area is Penrose. Described as an up and comer amongst Arlington’s 57 neighborhoods, Penrose is experiencing a revitalization of its own. New eateries are popping up everywhere and being the most diverse neighborhood in the area and more affordable than Clarendon, you can expect to find some unique, family-owned restaurants. And if you are trying to save costs on your next place, try focusing your apartment search on all bills paid apartments. 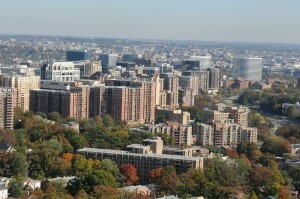 RentLingo is your trusted apartment finder in Arlington. We hire local experts, such as former property managers and locators to anonymously tour and consistently rate and review every available place. They share their honest and unbiased perspective with you, so you know how every rental ranks in the area. Because our experts tour every property, we can offer consistent apartment ratings across every region. So unlike finding a Backpage or Craigslist rental, you can trust these apartments are verified and trustworthy: whether it's a cheap studio or a one bedroom with all utilities paid all the way up to a nice house for rent or a luxury condo.